A great way to enjoy this evening, when many of us in NYC and in other parts of the North-East are holed up at home, thanks to Nor’Easter Nemo is to sip a hot cup of drinking chocolate or cocoa, wouldn’t you agree? It’s February, and City Bakery is hosting its annual hot chocolate festival, and no, I haven’t been there this year yet, although their calendar of different flavors of hot chocolate is extremely tempting. 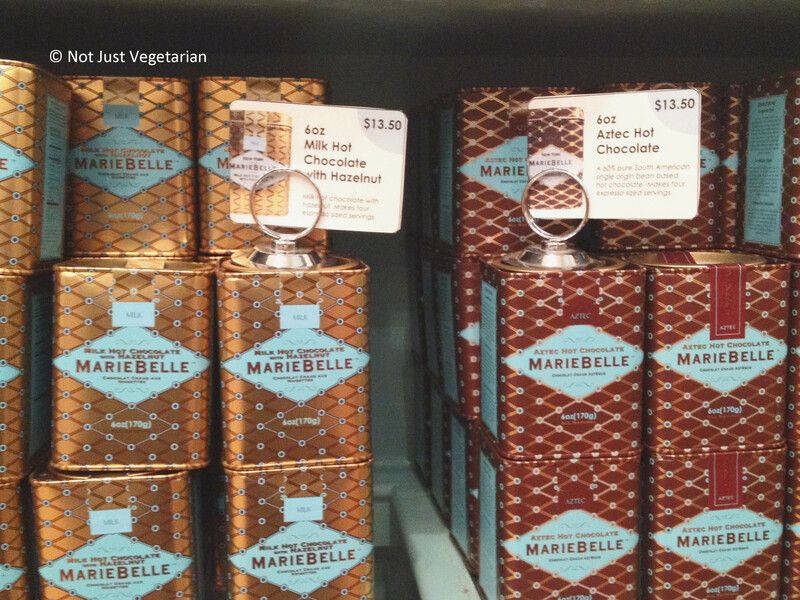 This post is about hot chocolate from MarieBelle in SoHo. When I wrote this post about hot chocolate where I ranted about not finding delicious, thick, decadent hot chocolate, one of this blog’s readers, a celebrity, Chopped Champion, and fellow food-blogger of Food Fix Kitchen recommended MarieBelle for hot chocolate, and I had to check it out for myself. I have been to Marie Belle a few times after I got her recommendation. You will enter the store in front, but please go to the cafe at the back. 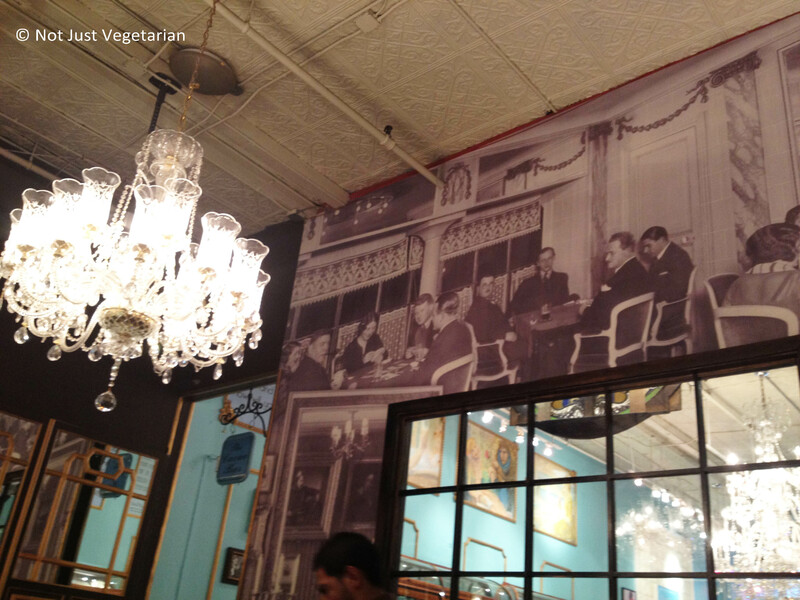 The cafe’s decor is very quaint – makes me feel as though I am in a European cafe or in one in Buenos Aires, with its high ceiling, chandeliers, and wall paper. 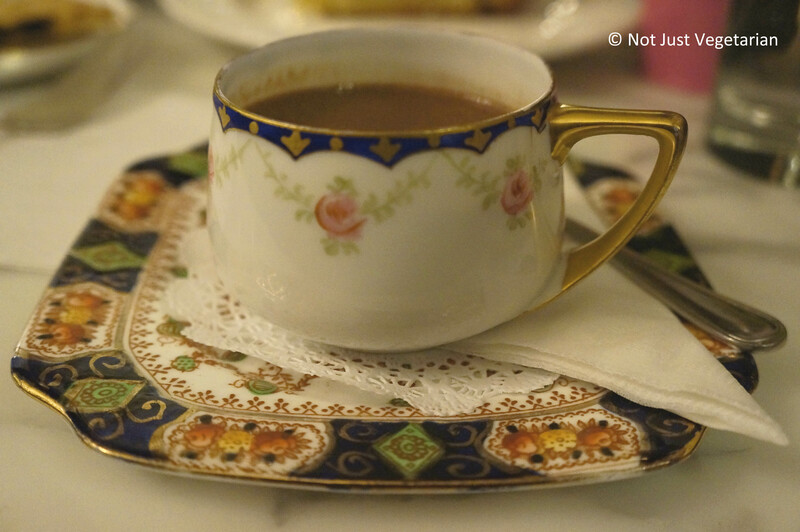 I simply love their hot chocolate, served in beautiful china. It’s a small cup (about 3 – 4 oz), but trust me it is packed with thick, decadent, chocolate goodness and calories too. 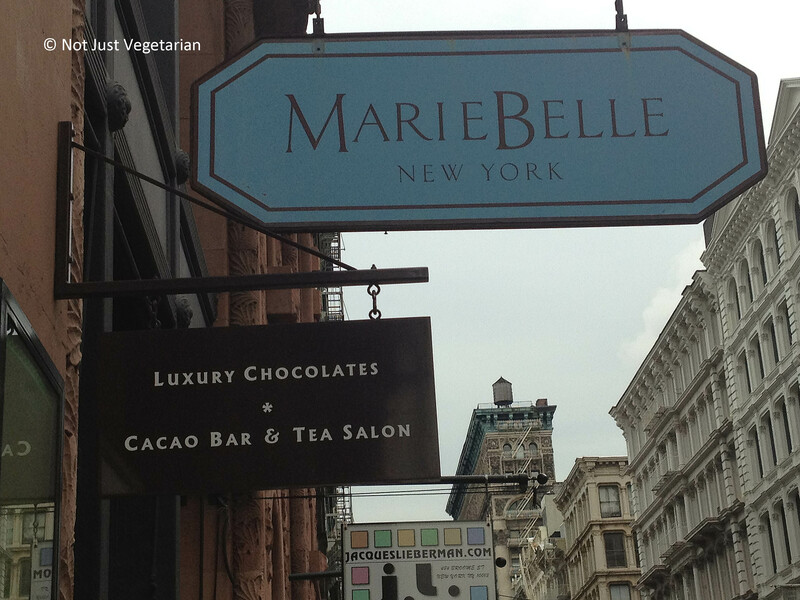 I find MarieBelle’s dark chocolate a little too dark for my taste, but you might like it. I crave the divine combination of milk, sugar, and chocolate, and their milk chocolate hazelnut hot chocolate is perfect for me. 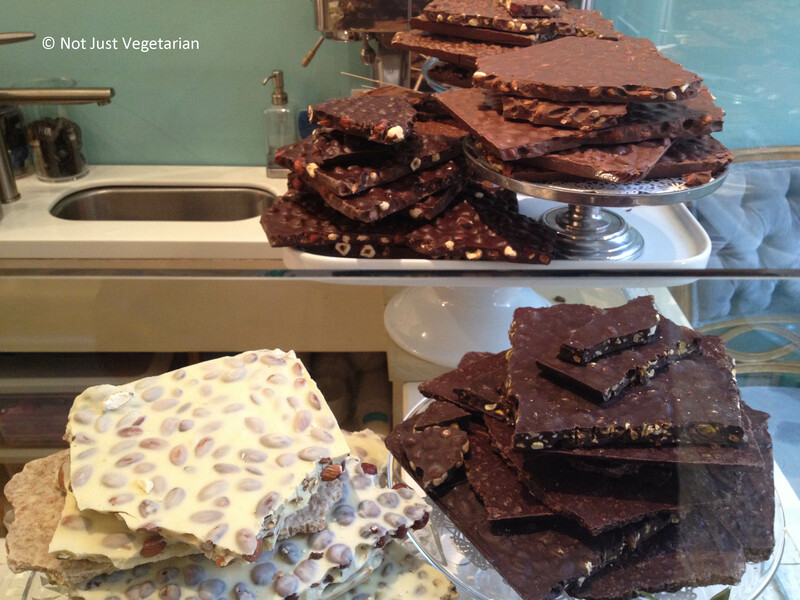 You will like MarieBelle’s dark chocolate Aztec if you like dark chocolate with loads of cinnamon in it. It’s not a personal favorite of mine. I tried their almond cake, their orange peel raisin cookie and their dulce de leche macaron. 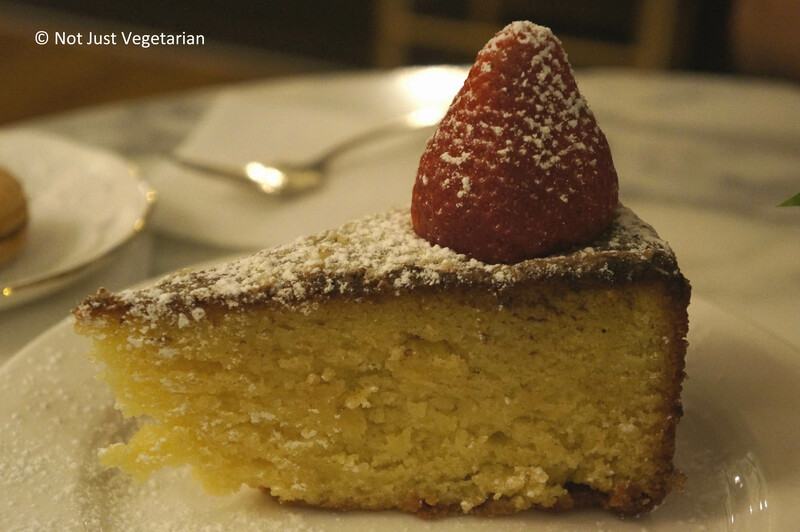 The almond cake was not-too-sweet or crumbly, but moist and dusted with sugar. I found the almond essence / extract overwhelming, but my friend was very happy with this cake. I have never had an orange peel raisin cookie before. It was a flat, brittle-like piece. 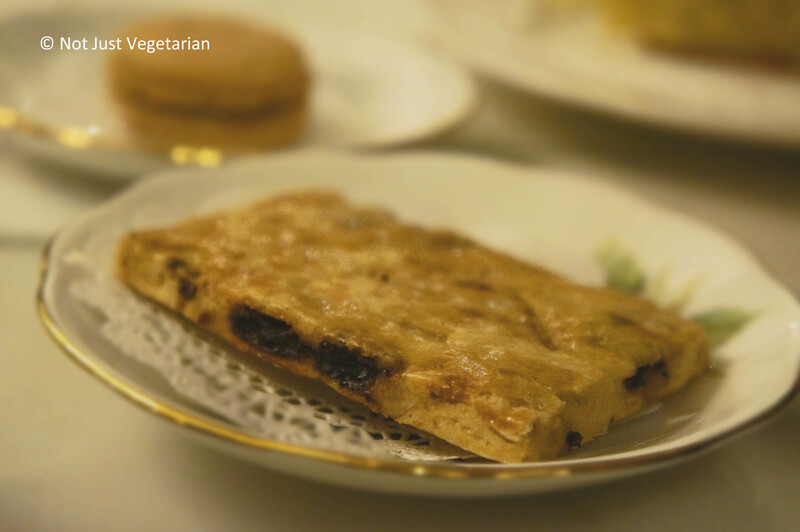 The sweet tartness of the candied orange peel combined with the sweet raisins made it irresistible. The dulce de leche macaron was fantastic. 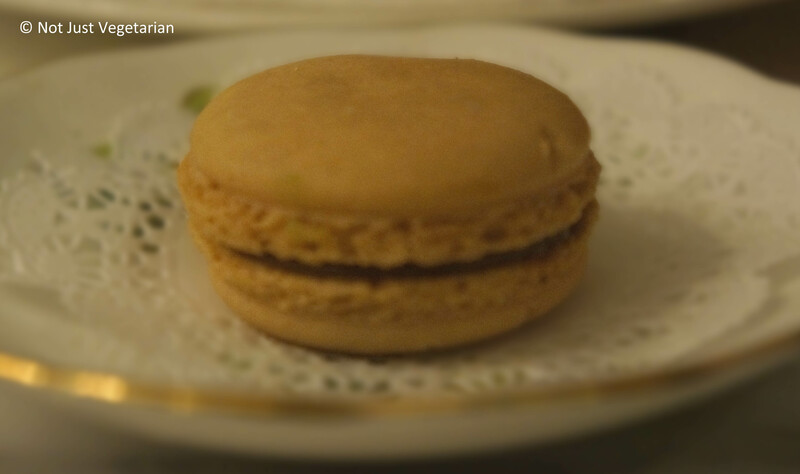 A thin layer of sweet, sticky, golden-brown caramel attached the two sides of the macaron. This macaron is definitely one of their best. Macarons are also available in other flavors like pistachio, chocolate, passion fruit, lavender, coffee, vanilla, and strawberry. Will try those at some point. Go to City Bakery or to Marie Belle and let me know what you think of their hot chocolates. Are there any other items that I must try the next time I am there?